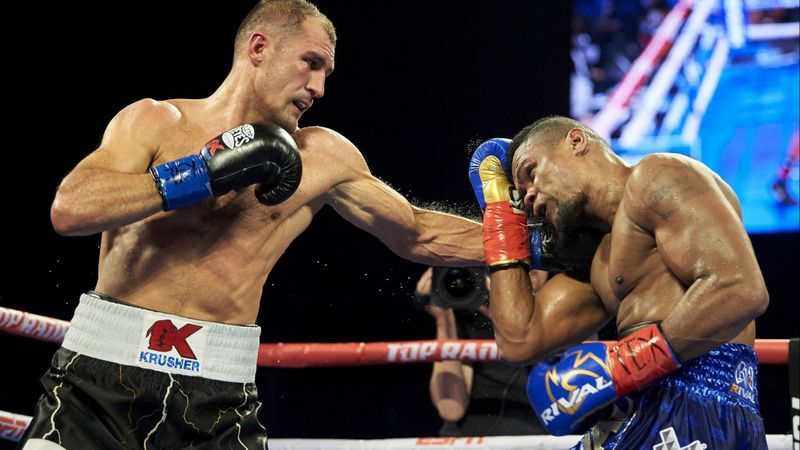 Sergey Kovalev became light-heavyweight champion for the third time Saturday night at The Star at Ford Center, with a unanimous-decision victory over Eleider Alvarez, who knocked out Kovalev last year. This time, Kovalev (33-3-1) found the reservoir of energy to draw upon through the middle rounds and regained the World Boxing Organization belt by scores of 116-112, 116-112 and 120-108. "My team helped me, they stopped me from over-training, told me, 'Stop, go home,' " Kovalev said. "We worked a lot on my jab and my power shot … like I was when I was an amateur." Kovalev, 35, applied pressure and won early rounds as he did in their August fight. Alvarez (24-1) found Kovalev with some power punches in the sixth, hopeful to tire the aging Russian, but he regretted throwing too few punches in the bout. Kovalev outlanded Alvarez in punches, 213-111. "I have no excuses. I tried to press the fight," Alvarez said. Instead, Kovalev was resolute and performed strongly into the 10th round, when he rocked Alvarez’s head back with a hard left. Alvarez’s corner told him he needed a knockout to win before the 11th, but Kovalev closed the bout with a hard right that backed Alvarez. Kovalev fought after being charged with felony assault by means of force likely to produce great bodily injury last year in San Bernardino Superior Court, and he’s due back in court March 11. Duva said the division has so much depth, including champion Oleksandr Gvozdyk and super-middleweight champion Gilberto Ramirez, that she’s enthused to make matches with whoever’s interested. In the undercard, Oscar Valdez sought to be more defensive minded in returning from an 11-month absence due to a fractured jaw, but the featherweight world champion couldn’t help himself given the opportunities presented. So, in a four-knockdown destruction of light-punching Italian Carmine Tommasone, Valdez successfully defended his WBO belt for the fifth time by finishing the challenger nine seconds into the seventh round. “I was very excited to get in there and didn’t want to get too crazy. But I did go crazy,” Valdez said after a right uppercut to Tommasone’s jaw closed the fight. After fracturing his jaw last March when he beat Scott Quigg by unanimous decision in Carson, Valdez aligned in San Diego with Canelo Alvarez’s trainer, Eddy Reynoso, to address defensive lapses that emerged in his last three fights. In taking on a former Olympian who knocked out only five of his first 19 foes, Valdez (25-0, 20 knockouts) quickly found the courage to return to his offensive style and backed Tommasone with hard jabs and a combination in the third. The battering worsened in the fourth when Valdez twice knocked down Tommasone (19-1), first with a right hand to the jaw and later with a left to the belly. Valdez dropped the challenger again in the sixth on a hard right to the head, punishing Tommasone with blows that inspired his corner to grab a towel, readying for surrender. Promoter Bob Arum said a March 23 date at the Forum for Valdez is possible, perhaps against former champion Carl Frampton of Northern Ireland or International Boxing Federation champion Josh Warrington of England, if he can avoid a mandatory challenger. Valdez said he hopes to fight four times this year. As for the battered Tommasone, whose right eye was bruised and bloodied, he said, “I give credit to Oscar Valdez,” then he proposed to his girlfriend, who saved the night by saying yes. Before that, Ghana’s Richard Commey (28-2, 25 KOs) impressively punched his ticket to an April 12 lightweight-title unification at Staples Center against two-belt champion Vasiliy Lomachenko, winning the vacant International Boxing Federation lightweight belt with a dominant showing in a second-round technical knockout of Russia’s Isa Chaniev (13-2). Commey punctuated an action first round by landing a hard right hand to the head that knocked down Chaniev and left him wobbled all the way to the bell. He was hardly saved because in the second, Commey uncorked a right hand that dropped Chaniev again. He had little time to recover as Commey surged and planted a powerful right uppercut that convinced referee Laurence Cole to stop the fight 39 seconds into the round. What impressed most about Commey, who stands two inches taller than Lomachenko, was his large frame packed into a 135-pound body. “I’m that strong. That’s natural,” he said. He paused when asked about Lomachenko after signing for the bout last week. “At the moment, I don’t want to say [anything]. I just want to enjoy this and live in the moment,” he said, adding he felt a twinge in one of the knuckles on his right hand when landing the first knockdown. “I don’t think it’s a big problem, but I need to get it checked out,” Commey said. Arum, meanwhile, was quite impressed. Unbeaten lightweight prospect Teofimo Lopez continued his highlight-reel rise toward a title shot by knocking out former title challenger Diego Magdaleno 1:08 into the seventh round. Lopez (12-0, 10 KOs) smashed Magdaleno (31-3) with two hard left hands to the head, the latter stopping the fight. Afterward, he somersaulted after earlier knocking down Magdaleno in the sixth. "There are going to be tough fighters. We've got to bounce and pick our shots," Lopez said of meeting the veteran. "Teofimo Lopez, whether you like him or hate him, you're going to watch. It's business, and what I'm doing now — it's entertainment."